Epimedium is a plant with some funny names: Barrenwort, Bishop’s Hat, Horny Goat Weed, Fairy Wings and Yin Yang Huo. Fairy wings for the tiny graceful flowers and Horny goat Weed for the aphrodisiac qualities popular in asian cultures. The thing I like about this plant is its texture. The leaves are papery rough. They sound like rustling paper when rubbed together. They toughen with age, not like a tender hosta or a juicy begonia. Like other groundcovers, the leaves are durable. The compound leaves have spiny margins and can be corlorful with bronzy pink in spring. 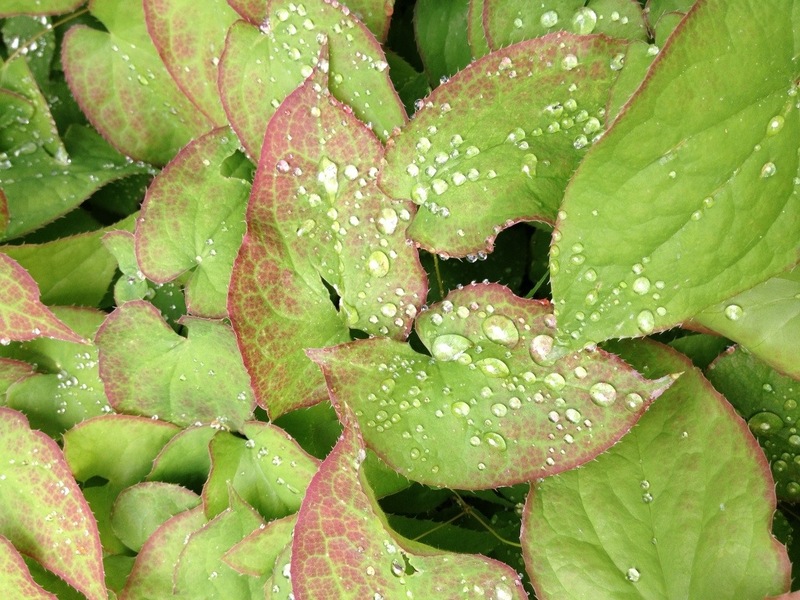 To see a wonderful collection of epimedium, check out the Plant Delights Website, the variety is amazing! One interesting fact about this plant is that the stems are underground. Only the leafstalks and leaves are above ground and in many varieties these are deciduous and they die back every winter. Epimedium flowers in the spring on airy stems held above the leaves with colors of pink, red, yellow or white. The flowers seem like clouds of butterflies…or fairies… rising up out of this groundcover, delicate in their pastel shades. This is a good plant if you have the dreaded Dry Shade. No sun, no water, who wants to grow there? Epimedium can grow under rhododendrons, in rock gardens and even in containers. Even though they can tolerate dry shade, their natural habitat is in light sun to part shade in rich, moist, alkaline soil. They are members of the Berberidaceae family and have similar cultural needs to Mahonia, Barberry, Podophyllum and Vancouveria. The last horticulture class I took they taught the use of equipment to build a garden. During that exercise I had my first introduction to Epimediums. I am really impressed with this plant and I am always looking for new information on this subject. Thank you for posting. I love these plants too. They are called “elf flowers” in German (Elfenblumen) and I find it a fitting name. They look especially gorgeous with the water droplets! Wonderful photos!